Dip clean cotton ball in some fresh lemon juice (add 1 teaspoon of honey in lemon juice) and rub it directly on the dark spots and dark circles under eyes. Leave it for 15-20 minutes and then wash it off with warm or normal water. To see unbelievable result, do this daily for 2 weeks. If your skin is very sensitive, you can add some water or rose water in the lemon juice with honey. This mixture can also be applied on elbows and knees to lighten the dark areas. Take 1 liter clean water in bottle and add 5-6 tablespoon of fresh lemon juice in it. Use this water to wash your face throughout the day. When you go out use this water to wash your face and when you stay at home, wash your face with this water and apply 1 teaspoon of honey for 10 minutes. Do this regularly to lighten your dark spots. Add 2 tablespoon of fresh lemon juice in 2 tablespoon of fresh apple paste and mix well. Apply this paste on the affected area and wash with normal water after 30 minutes. Do this once a day for 30 days; you can see the amazing result. Crush half fully ripe banana, make a fine paste of it, and add 1 tablespoon of fresh lemon juice and 1 teaspoon of raw honey mix well. Apply this paste on your face for 30 minutes and wash off with lukewarm or normal water. 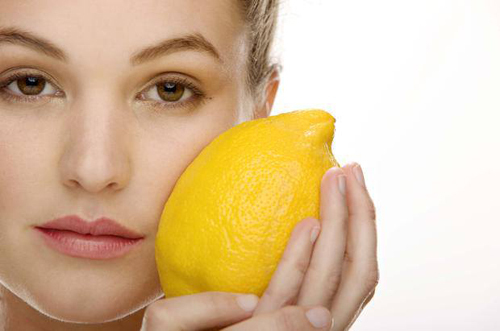 Combination of lemon juice and banana is very effective to remove dark spots, acne scars and other skin marks. Do this daily for 4-5 weeks. Grind cucumber and squeeze juice from it (2 tablespoon), add ½ teaspoon of turmeric and 1 tablespoon of fresh lemon juice in it. First, gently rub your face with lemon peels for 2-3 minutes, then apply the above paste for 30 minutes on your face. Wash off with normal water. Mix 1 teaspoon of rose water with 1 tablespoon of lime juice and ½ teaspoon of turmeric powder and make fine paste. Apply this paste for 20-30 minutes and rinse off with normal water. This face mask can fade suntans. This mixture can also be applied on elbows and knees to lighten the dark areas. First, wash your face (don’t use soap), cut lemon in 2 equal pieces, gently rub on your face, rub for 5 min and then leave for 5 minutes. Wash your face using cold/normal water. Apply honey for 10 minutes as moisturizer. Dissolve 1 tablespoon of sugar in the 2 tablespoon of lemon juice, mix well and directly apply on the face or affected areas and under eyes area for 20-30 minutes. Wash off with normal water.